With a 38 m² terrace, jacuzzi, free and unlimited internet access and VOD, and air conditioning. A pleasing setting created for the enjoyment of its guests, the Terrace Suite combines refinement and easy living. With the highest quality materials, warm colours, and deep armchairs and sofa, the suite includes a spacious living area which opens out onto the beautiful terrace, enhanced by a glass and stainless steel jacuzzi, and has two bedrooms including a large and comfortable master bedroom. Every detail has been carefully thought out, developed, and designed before being made to measure. The interior design is inspired by the motionless journey concept, transcribed through an interplay of trunks and objects collected across all the continents. The spacious living area has a dining space which can accommodate up to six people. 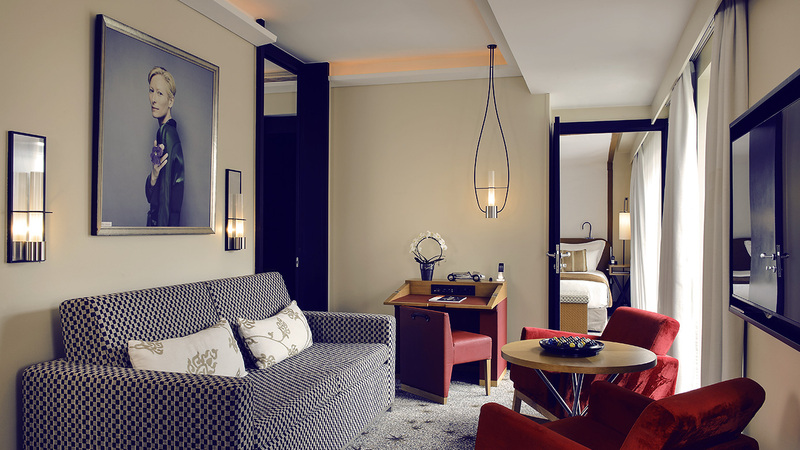 With furniture and lighting tailor-made for the hotel,  lounge with high-tech amenities, free minibar, iPad loan on request, and a Nespresso machine. The suite has two private bathrooms which open out onto the bedrooms thanks to an ingenious interplay of subtle lacquered dove-coloured blinds and shutters. The main bathroom has a shower and bathtub. The second is a private shower room.